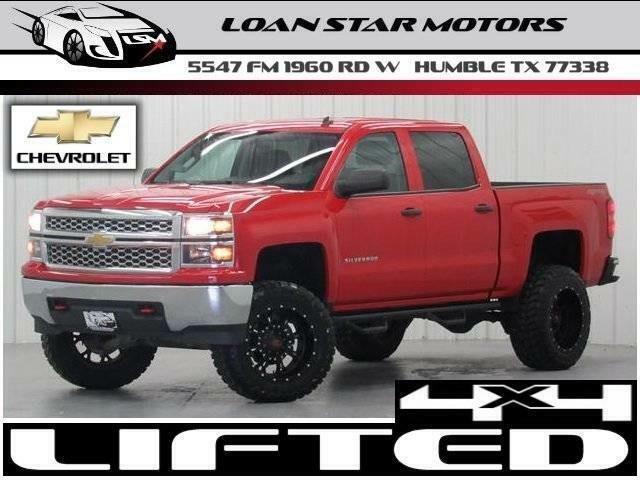 2014 CHEVROLET SILVERADO 1500 CREW CAB 4WD LIFTED 5.3L ECOTEC3 4X4 35 INCH MUD TIRES LEATHER 4-WHEEL DRIVE LOW MILES 100% AUTOCHECK GUARANTEED WE FINANCE WAC. Call us now for more details 800-651-1718 At Loan Star Motors we offer the lowest rates and loan terms for your best deal. We have teamed up with many financial institutions to provide you with the best financing options possible. At Loan Star Motors we AutoCheck every vehicle before purchase and do a DMV background check. Welcome to the Loan Star Motors Family. Thanks for shopping our inventory and we look forward to assisting you in your next purchase. WWW.LOANSTARMOTORS.COM We stand behind our product with a low cost 30 day warranty on all Domestic and Import model vehicles. At Loan Star Motors we offer financing as low as 1.99%. NO CREDIT - BAD CREDIT REPO - BANKRUPTCY - E-Z SPECIAL FINANCING OPTIONS. Family environment Upfront & honest! Call Now & See How Easy It Is! College Graduate Program! Great Discounts for Military Police and Fireman! PHONE: 800-651-1718 Sophistication & understated luxury comes standard on this Chevrolet SILVERADO 1500 CREW CAB 4WD LIFTED 5.3L ECOTEC3 4X4 35 IN MT. Well-known by many the SILVERADO 1500 has become a household name in the realm of quality and prestige. With 4WD you can take this 2014 Chevrolet SILVERADO 1500 to places roads don't go. It's all about the adventure and getting the most enjoyment out of your new ride. The Chevrolet SILVERADO 1500 CREW CAB 4WD LIFTED 5.3L ECOTEC3 4X4 35 IN MT will provide you with everything you have always wanted in a car -- Quality Reliability and Character. More information about the 2014 Chevrolet SILVERADO 1500: The full-size pickup truck segment has never been more popular or more competitive. With its 2014 Silverado 1500 Chevrolet has staked its claim once again as king of the hill. The new Silverado boasts a refined level of comfort sophistication and brute force now found in trucks from Ford and Ram specifically in the all-aluminum range of engines where Chevy has laid claim to the most fuel-efficient V8 found in a full-size truck. In fact at 23 mpg on the highway the 5.3L unit provides a better return than the turbocharged V6 employed in the Ford F-150. Add in the fact that Chevy managed to make so many innovative changes while keeping the base price steady and it's no surprise that the new Silverado is a hit. Interesting features of this model are best fuel economy of any V8 pickup Improved interior with added comfort and convenience extensive features and options and best-in-class tow ratings WE OFFER NATIONWIDE FINANCING OPTIONS COMPETITIVE RATES DISCOUNTED SHIPPING AND WELCOME TRADES. Extended warranty programs and low APR financing available (With Approved Credit). Toll Free 1-800-651-1718 Visit us on the web at http://www.loanstarmotors.com All advertised prices exclude government fees and taxes any finance charges any dealer document preparation charge and any emission testing charge. The price for listed vehicles as equipped does not include charges such as: License Title Registration Fees State or Local Taxes Dealer Prep Smog Fees Credit Investigation Optional Credit Insurance Physical Damage of Liability Insurance or Delivery Fees. DEALER makes no representations expressed or implied to any actual or prospective purchaser or owner of this vehicle as to the existence ownership accuracy description or condition of the listed vehicle's equipment accessories price specials or any warranties. Any and all differences must be addressed prior to the sale of this vehicle. Your actual mileage will vary depending on how you drive and maintain your vehicle.